A former publisher and Luddite of old-world printing, Simon has been banging out ideas since the advent of correction tape and typewriters (hey, it wasn’t that long ago). He lives in the Canadian Rockies with his wife and two dogs, and spends most of his time daydreaming, chopping wood, hiking in the alpine and hammering on the keyboard, usually with a little too much fervor. Algarth Willowbrow has watched his Order crumble into nothingness. He has nothing left to lose, but everything to gain if his gamble pays off. He must find a way to harness the power needed to save himself and the world around him. But he alone is not enough. He will need the help of another. This is where Bartholomew Waxman comes in. He is a simple derivatives broker, though not a very good one. He's lost everything and now finds himself preparing for a job interview of all things. That is when he is whisked away suddenly to the Between, where a strange entity prepares him for the task of determining a world's fate... In Simon Lindley's book, Mannethorn's Key, it is up to Bartholomew and Algarth to save the world, or die trying. 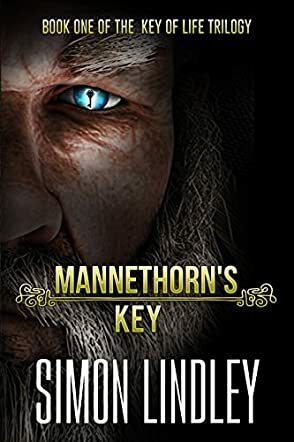 If you've devoured The Lord of the Rings series and need a new epic fantasy fix, I think Mannethorn's Key may be exactly what the doctor ordered. There is so much world building and creativity within these pages that you can't help but soak it all up. And by the end of this wild ride, you realize there are hopefully more books to come! Simon Lindley's Key of Life Trilogy is sure to be action packed, full of mystery, and an epic adventure all rolled into one. And the character building is actually very impressive here. I think there could be a bit more refinement in some of the sentence structures and the general flow of the words, but, all in all, this is an impressive offering by Lindley. I will definitely be keeping an eye out for the next installment.